In our regions, the grayling is probably the salmonidae which has, the last twenty years, contributed the most to the development of new flyfishing tactics. Of course, traditional techniques (Dry, Wet, Nymph, Streamer) have been developed first for the chase of trouts. But after all, most of these techniques soon showed their limits when thy were used to seduce graylings. The Dry fly fisherman had to refine its equipment (flies, leader,. ..) and its approach (drifts, casts,. ..) By using a tram of wet flies, against an adversary definitely less impulsive than trouts, he had to aknowledge he was missing too many strikes or that some fishes simply ignored his flies. The nymph quickly appeared as the ideal solution to the problems posed by the two traditional techniques. Skues, Sawyer, Kite and others had naturally developed the nymph technique to capture trouts from their chalkstreams. In its original description, this technique capitalised on fishing conditions almost impossible to find on the continent. Thats why, destined for slow rivers, clear and rich in insects and trouts, it took a while to cross the Channel. Until some flyfishermen, aware that it was necessary to be inventive to obtain more satisfying results, adjusted old technique from Skues and Kite to the fishes from our rivers. Actually, most of these anglers came from the edges of waters extremely rich in graylings, sufficiently clear so that they had the visual evidence of the poor efficiency of ancestral techniques. Two approachs came out these two environments: The technique of the heavy nymph and the" signt fishing nymph". The first saw the light on the rivers from eastern Europe, packed with graylings but barely clear and sometimes deep. Graylings populating these rivers come from a species more gregarious than ours. They lie on the bottom and rise rarely. However, the huge wealth in grubs, nymphs, shrimps and molluscs allow largely the rapid development of populations. It was necessary to find a way to reach graylings hidden in the streams, sometimes by boils, always deep. Fortunately, insects lying on the bottom are rarely of small size, and their imitation, relatively easy, allows the adjunction of a sufficiently important quantity of lead. A technique appeared, using nymphs tied on hooks Nr 8-12, heavily weighted, destined before all to"tap" on the bottom. On some rivers where flies do not sink easily, flyfishermen equally fix lead on the leader. This assembly heavy enough, often tiresome to manipulate, poses some problems during of the recognition of the strike. But one rule, which prevails for all fishings with nymph, comes to help the flyfisherman: "More the current is mighty, more the strike will be notable." Indeed, in these well marked streams, the fish has no time to carefully inspect the fly. The quantity of graylings induces a big competition between them, the depth gives them a greatest feeling of safety, fishes are heavier, so the strikes are allways mightier than in our rivers. This way, Czeches, Polish and other Rumanians regularly realized some remarkable performances during Flyfishing World Championships. Sometimes, even the gold medal has been their reward. The nymph fished on the bottom is not only efficient with graylings and some great rivers hide beautiful populations of trouts on similar locations. These last years, more and more american fishermen practice this way to reach the large rainbows and brownies that haunt the powerful and deep streams from rivers lile the San Juan, the Big Horn, the Missouri, the Yellowstone and many others. Over there, our colleagues are not anxious about our purist fashions. They regularly use two nymphs highly weighted (biodegradable lead), and use a large fluorescent pump to notice the strike. I dont dare to imagine the reaction of some of our esthetes if they suddenly were in front of such an artillery. By the way, its very amazing to know that the flyfishermen from Montana completely ignore graylings populating some rivers from their huge hydrographic network. For them, this fish literally jumps on any food and therefore doesnt present any interest for the flyfisherman sportsman. Other places, other fishes, same ways of fishing. But lets return to our dear Thymallus. The deep nymph fast crossed the wall. It was rapidly popularized among flyfishermen, although some fishing on the same kind of western rivers mastered it already. The technical characters were however adapted to more smallest depths and to more demanding fishes like we generally meet here. It was necessary to decrease the size and the weight of nymphs, to refine the perception of strikes, and especially to fight against the legacy which Halford transmitted us. Damn, it was so far from the "Dry Fly Only"... and so close from the fishing with naturals! Attitudes changed however very fast, the efficiency being a luxury which our rivers gave us less and less away. The Flyfisherman who had no possibility to patronize the river, rediscovered our populations of graylings who didnt use anymore to rise. Trough it, the deep nymph already permit a "geographical democratization" of the flyfishing, allowing the catch of beautiful and numerous fish out of the rare periods of madness, often reserved to the "locals" . Such a way that some French fishing administrators became famous for their « open mind », by forbidding the nymph on " their "part of river. It is necessary to say, my dear sir, that these peoples poorly appreciate that a fellow from the city comes to catch a big fish just in front of one local fisherman. So what! The deep nymph therefore refined a little bit. Two techniques emerged: The deep nymph with indicator and the sight fishing nymph. According to the rivers degree of limpidity where they fished, the flyfishermen first developed one of both. And they switched to the other one when conditions allowed it, or forced it. Ill try to describe the different common appearances for these two fishings, then I will end by those which are typical of each. The most used hooks for nymphs range from size 12 to 20. It concerns imitations of caddis larvas for the biggest sizes, schrimps, mayflies nymphs, chironomidae, small water snails. Im not going to make a long description of the best nymphs, but ill rather attempt to specify some common characteristics from the good nymphs I know. First of all, the general appearance. 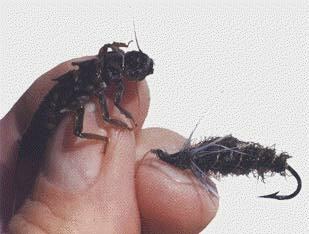 Contrarily to the most used for the trout, youll not see a lot of typical imitations, like the Pheasant Tail, present in nymphs boxes for graylings. Actually, and I dont know why, the tail is rarely present on the "conventional" nymph for grayling . Is it the fact that numerous anglers imagine that the tail could prevent the ingestion of the fly, considering the legendary small mouth the grayling? When I see the size of some larvas greedily swallowed by our buddy, I hardly imagine that it could be a good argument. For the dry, maybe, but for nymphs, sure not. Is it because it could facilitate the nymphs dive, by giving to the fly a shape as hydrodynamic as possible? Perhaps partially. The grayling is a bottom fish and he's subsenquently highly interested by picking the burrowing grubs and especially insects living near stones. It seems to me a more accurate argument. Because a lot of imitations reserved to this kind of fishing imitate caddis grubs or schrimps.